roles women play in this space. Ilwad chairs and participates in several bodies working on gender based violence in Somalia and beyond. 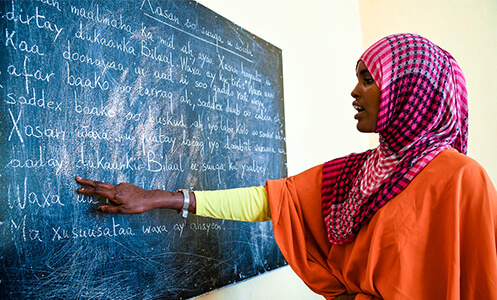 Ilwad Elman is Director of Programmes and Development at the Elman Peace and Human Rights Centre in Somalia. The Centre’s programmes focus on human rights, gender justice, protection of civilians, CVE, and peacebuilding across Somalia and the Horn and East Africa region. She is interested in how women propagate and counter violent extremism as well as the gendered impact of CVE strategies on women’s lives. She believes that policy makers who involve and empower women in CVE initiatives must understand the various roles that women play, including the motives that attract some women to violent extremism. of global change and innovation. It is essential to rehabilitate and reintegrate violent extremists or terrorist fighters who return from abroad. To do so, we can borrow from Disarmament, Demobilisation and Reintegration (DDR) procedures that UN agencies, governments, and civil society have developed for combatants who surrender or are captured in war. It is essential to rehabilitate and reintegrate violent extremists, or terrorist fighters who return from abroad. 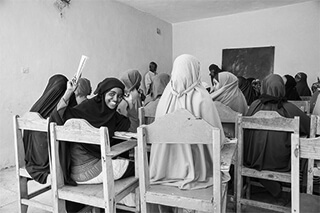 Ilwad Elman and the Elman Peace Center work with returning and at-risk young people to counter violent extremism. A youth-led peer-to-peer approach to rehabilitation can be especially effective because so many extremist fighters are young. At the same time, it requires resources and expertise. Those who undertake such activities must recognise that it is a complex process and should prepare accordingly. Traditional DDR assists ex-combatants to rebuild their livelihoods and support networks at the end of conflicts. Returning violent extremists face a similarly difficult transition. Disengagement, deradicalisation and rehabilitation programmes (D2R) can assist former extremists to rebuild trust, reintegrate with family and friends, and recover economic and personal security. The political grievances of ex-combatants do not simply dissipate when they disarm or return. Left alone, many will continue to sympathise with the cause they joined, even if they cease to be violent. Programmes that address why they engaged in violent behaviour are therefore essential. D2R programmes focus on the needs of combatants who have demobilised or surrendered, taking into account their longer term socio-economic integration as well as the security concerns they may create. Their goal is to prevent the recurrence of violence and promote the reintegration of former combatants into society. A youth-led peer-to-peer approach to D2R can be especially effective because so many extremist fighters are young. At the same time, it requires resources and expertise. Those who undertake D2R need to recognise that it is a complex process and should prepare accordingly. The Elman Peace Centre’s Drop the Gun, Pick Up the Pen (EPHRC) successfully disarmed, rehabilitated and reintegrated thousands of young women and men co-opted into clan militias by warlords, enabling them to peacefully rejoin their communities and enjoy alternative livelihoods. Decades later, conflict in Somalia continues to rage and young Somalis are being co-opted by new hybrid armed actors and the transnational network of Al-Shabaab. EPHRC responded by designing a community-based approach to D2R for Al-Shabaab combatants that takes account of the highly asymmetrical nature of Somalia’s conflict and is potentially relevant to conflicts elsewhere. Provides individual support to disengaged combatants in inte rim care centres. Services include psychosocial care, vocational training, and training in life skills. Uses focused advocacy to build the awareness of communities, government and security actors. Strengthens the capacity and commitment of communities to prevent recruitment and radicalisation. The programme operates in areas of continuing conflict where control over communities may shift frequently between the Federal Republic of Somalia and Al-Shabaab, as well as areas that are now calm. 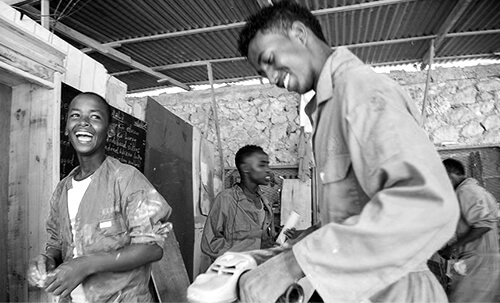 Working with ex-combatants, ‘active’ combatants and ‘at risk’ populations, EPHRC has rescued child soldiers, kept communities affected by violent extremism together, and helped thousands of disillusioned young Somalis who want to stop fighting but are unable to see any opportunities outside if they do. 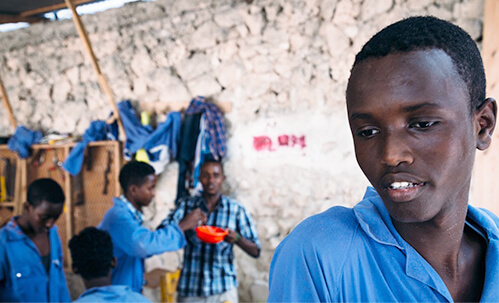 To these young people, EPHRC offers practical life skills, religious literacy, vocational training, psychosocial support, peer-to-peer mentorship, training in business and financial skills, and startup grants. Has research been done that will help you understand the context in which you are working? Can you obtain all the information you need about the those who are returning to their countries? What is their current commitment to violent extremism? Are they dangerous, disenfranchised, disturbed or something else? Can you obtain the information you need about the resources available to assist them to reintegrate? Do you know enough about the societies that will receive them, their institutional capacity, and the laws that are relevant to returning combatants? Education initiatives at the Elman Peace and Human Rights Center seek to help communities gain new skills and strengthen bonds to counter extremist narratives. The Elman Peace Centre’s Drop the Gun, Pick Up the Pen (EPHRC) successfully disarmed, rehabilitated and reintegrated thousands of young women and men co-opted into clan militias by warlords, enabling them to peacefully rejoin their communities and enjoy alternative livelihoods.